Start adding the basil leaves in small handfuls alternating with olive oil. When all the basil leaves are added introduce the pine nuts and cheese. Blend until a smooth consistency (2-3 minutes). Light coat the fillets with corn starch. Heat up the pan and pour in the olive oil. 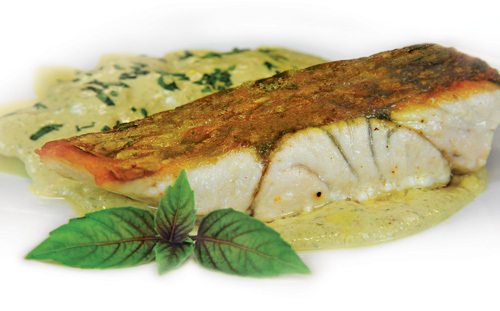 Pan-fry the barramundi over high heat (about 3-4 minutes on each side). 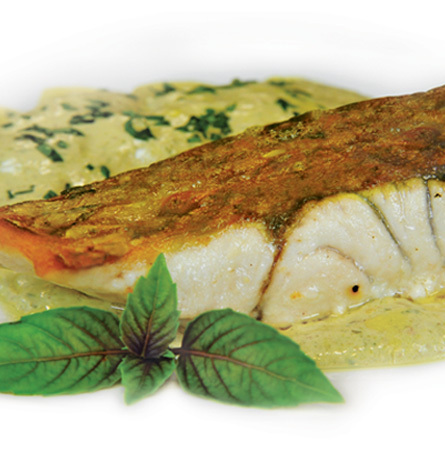 In a small pot, heat up the cooking cream to a simmer, add 5 tablespoons of the pesto into the cream and stir until a rich consistency..
Pour the cream sauce onto the fish and serve immediately with boiled potatoes.